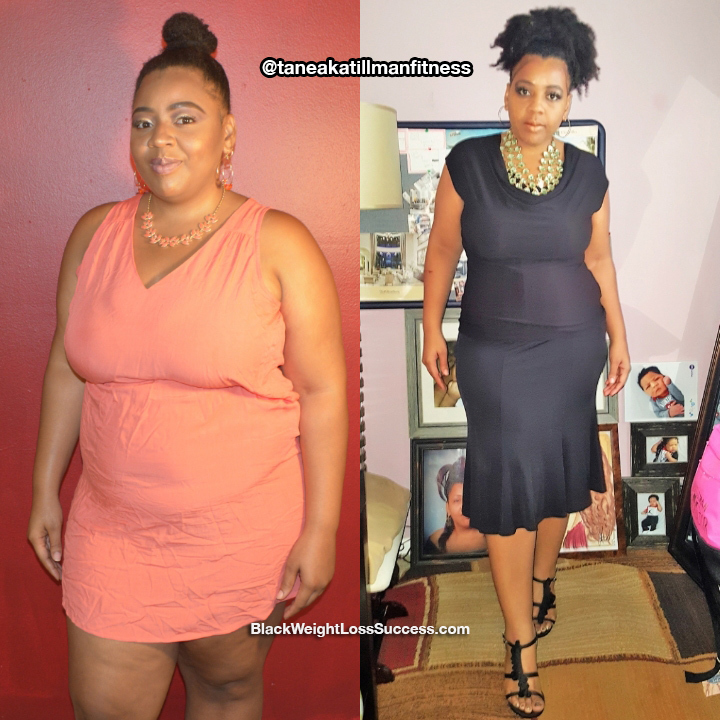 Transformation of the Day: Taneaka lost 42 pounds. After giving birth to her first son in 2014, she let herself go. By 2017, her health was deteriorating, loved ones were commenting on her weight and she didn’t like what she saw in the mirror. 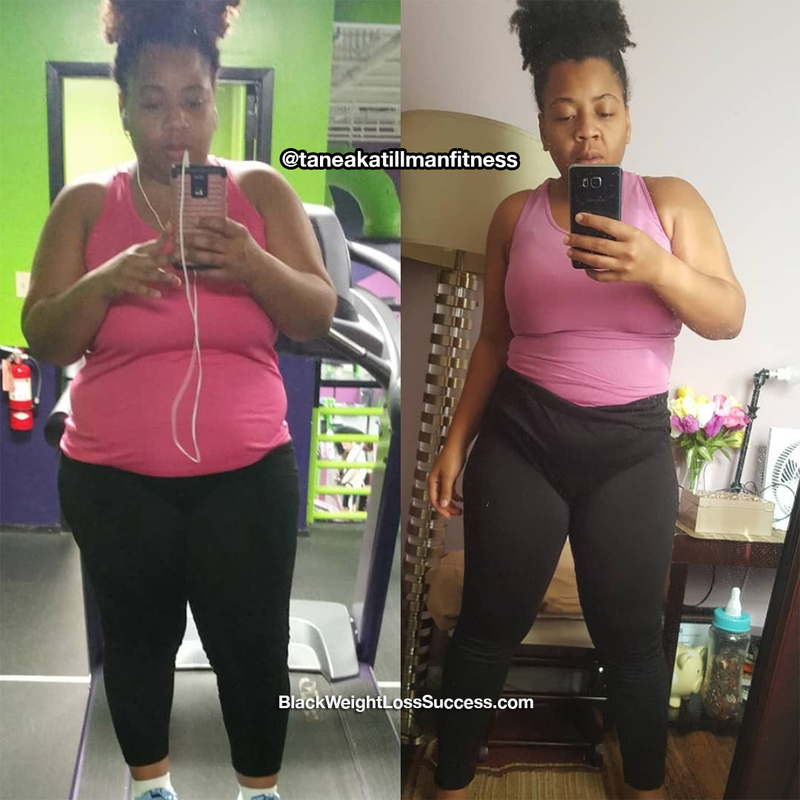 She decided to hit the gym, change her eating habits and create a new, sustainable healthy lifestyle. After giving birth to my first child my son in 2014, I lost myself and let myself go. I was just living life with no worries about my health or well being. Fast forward to 2017… I was so unhappy with what I saw in the mirror and that was taking a big toll on me. Also, my health was deteriorating, and loved ones often reminded me that I was getting bigger and bigger. My breathing was out of control when I did basic things, like walking to my car or to the mailbox. That’s when I realized that it wasn’t fair to my son for me to not have the energy I needed to do simple things with him, like just playing outside. One week before my 30th Birthday, I decided to get back into the gym and take baby steps towards bettering my health. The constant thought of not letting my son down… or better yet not letting myself down. I keep thinking about where I will be a 1 year or 2 from now. out and started cooking leaner, healthier foods. I had a higher fat/caloric meal once a week. My journey is about balance and creating a lifestyle that is sustainable for the long run, so I’ve never eliminated foods from my diet. However, I did cut back from eating fried foods, like fried french fries and fried chicken. I also cut back on burgers, chicken alfredo, cake and having ice cream “everyday”. I swapped those foods with healthier options, such as baked salmon, baked french fries, fresh veggies (lettuce, cabbage, celery, greek yogurt, smart popcorn and fresh fruit). I drink a lot of water and freshly made smoothies. My biggest success came from counting calories with My Fitness Pal and measuring my food. My current workout routine consist of 4 days strictly doing 1 hour cardio sessions such as cycling which is a group class I take at my gym, sprints, and the stair climber and 2 days are dedicated to strength training which I currently take a 1 hour group class called Total Body Sculpting followed by 25 min of Cardio I workout 5 to 6 times a week. My starting weight was 226.5 pounds and my current weight is 184.5 pounds. My height is 5’2″. March 15, 2017. 15 months and I’m still working. Being healthy and getting healthy is a lifestyle that has to be prioritized. You can’t wing it. You won’t always feel motivated, but if your meals and workouts are planned out ahead of time and included in your daily tasks it will become second nature to just get it done. This has allowed me to achieve victories well into my 15 month journey. Don’t look at this journey as a diet. Remove those high calorie foods from your diet slowly and replace them with healthier options until it just sticks with you. Often times when we feel restricted. That’s when we fail or fall back into old habits. Don’t compare your journey or body to anyone else’s. Do this at your own pace. This isn’t a race, it’s your life. Sure, losing 10 lbs or 15 lbs in a month gets people excited, but if you lost 4 to 8 lbs a month that’s even more exciting to me. It takes a different type of strength in order to master slow and steady weight loss. Take your time and never beat yourself up. The last thing you want to be is the person who is bullying their own body.